The cover of the new 2018/19 Jersey Directory, being delivered to homes and businesses from this month. 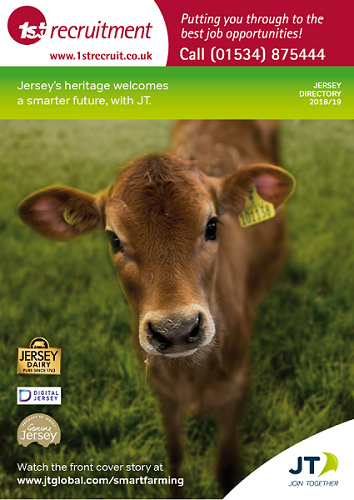 It celebrates one of our Island’s greatest ambassadors, the iconic Jersey cow, and highlights how technology is changing the face of farming and celebrating a full-fibre farming future. Over the years, the Jersey Directory cover has aimed to focus on parts of Island life. Especially, parts where JT is helping to make a positive difference. She may not know it but the star of this year’s cover, Roseland Roy Boy Tulip, who was born in October 2017 at Cowley Farm in St Saviour, is a living example of the latest smart farming practices. Tulip has an electronic tag on her ear which connects to a computer via a radio link. This provides the farmer with rich information in real-time about her behaviour, location and wellbeing. For example, a monitor beside each milking unit in the parlour can identify Tulip and every other cow in the herd. Based on her age and other statistics, the computer will know exactly how many litres of milk she should produce. As well as how much food she needs to support that. This technology also allows Jersey Dairy, which sells its products globally, to evidence the origins of the Island’s famous export. Devices communicating automatically with other devices (called the Internet of Things, or IoT) is expected to play an even greater role. Not just in agriculture, but in all our lives. This is why JT is helping Digital Jersey to build a state-of-the-art research centre to encourage more IoT business start-ups. As well as foster technological education for local students and encourage off-island organisations to use Jersey as a test bed.